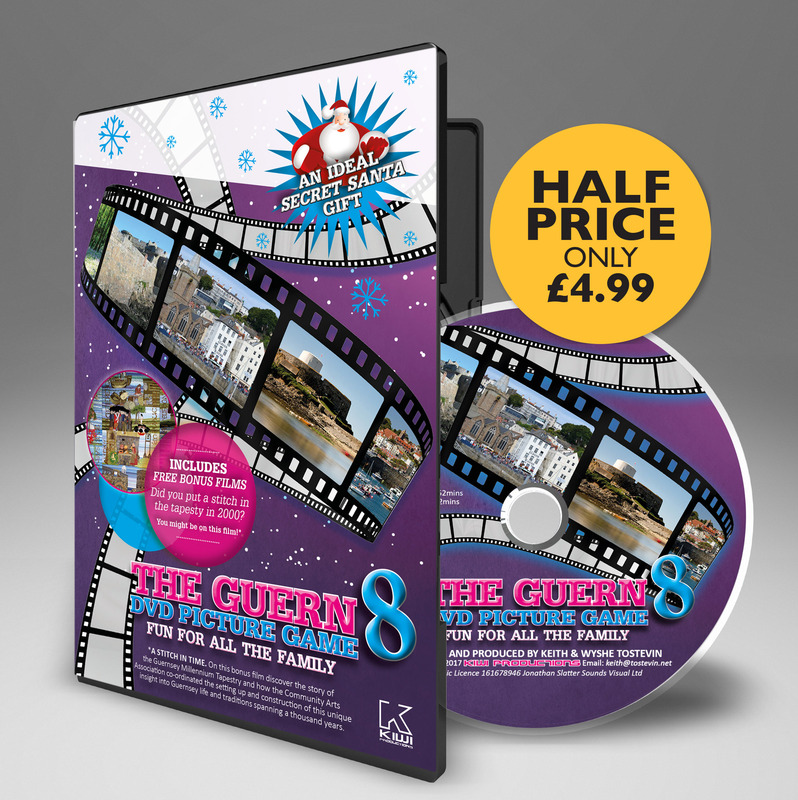 At the beginning of the First World War the Channel Islands were still being defended by regular British Army units – with Regiments being stationed in the islands for several years at a time – and by the local Militias. 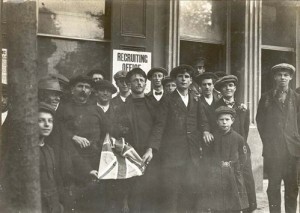 Militia service in Guernsey was still compulsory for all men in the island. However since 1204 – when King John lost the Duchy of Normandy to the French and the Channel Islands were granted ‘rights and privileges’ to govern themselves – islanders could not be compelled to serve overseas except “to rescue the Sovereign if captured by enemies”. 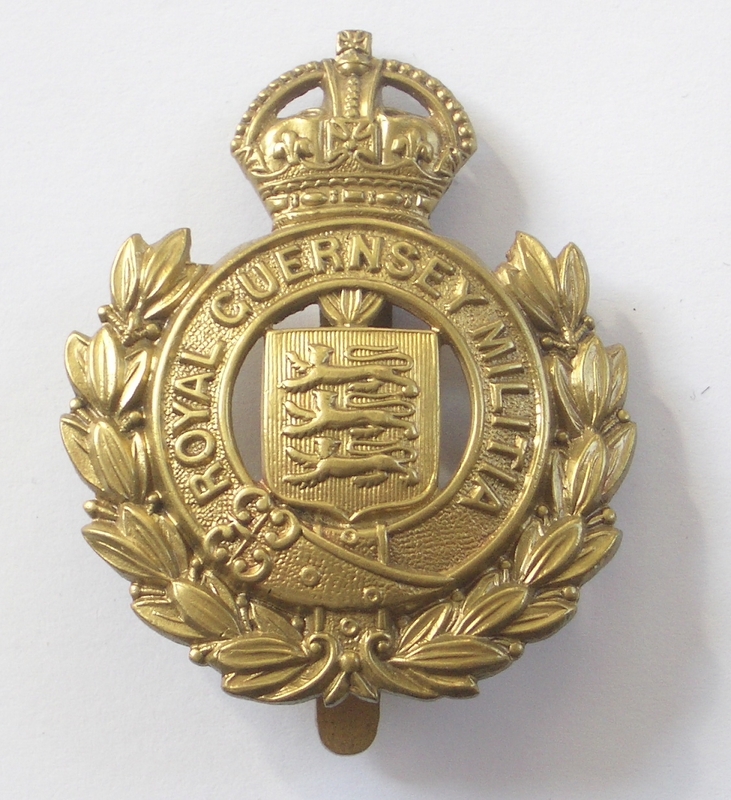 At the outbreak of war in August 1914 the Guernsey Militia was mobilised in order to free the Regular Army units of the garrison for overseas service. Whilst not being liable for service many individual Guernseymen did join the Navy and Army anyway and the recruitment of volunteers began in the island as soon as hostilities commenced. The men that left the island in these circumstances were to serve in two capacities : As infantry in the 16th Irish Division and in the 9th Scottish Division’s Ammunition column. In this article we look at an outline of the events that these brave volunteers went through in the course of serving their king, country and their island as part of the Irish Division (The Divisional Ammunition column is the subject of another article “The Guernsey Scottish“). Note : Photographs have been reproduced with kind permission of the Priaulx Libray and the Imperial War Museum. been delighted with the conduct and cheery hospitality of the 2nd Battalion who were stationed there just prior to the war. 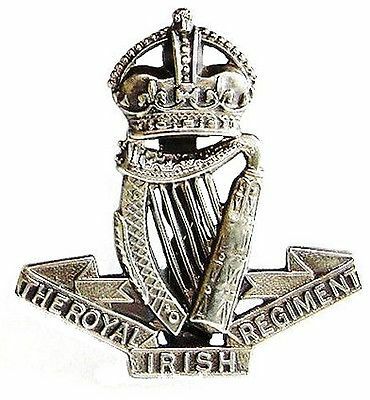 The infantry would eventually go to the 16th Irish Division (into the Royal Irish Regiment & the Royal Irish Fusiliers), whilst the Divisional Ammunition Column would go to the 9th Scottish Division. NOTE : A Divisional Ammunition Column is responsible for the resupply of ammunition to a particular division. It is organised into 2 parts: one for Artillery + one for small arms for the infantry. 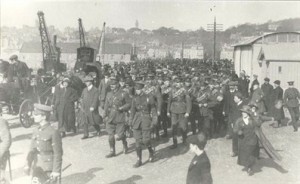 The first contingent of Guernsey Militia men, consisting of 7 Officers and 239 other ranks leaves Guernsey to join the 6th Battalion Royal Irish Regiment (RIR) at Fermoy in Ireland. They will form D Company. 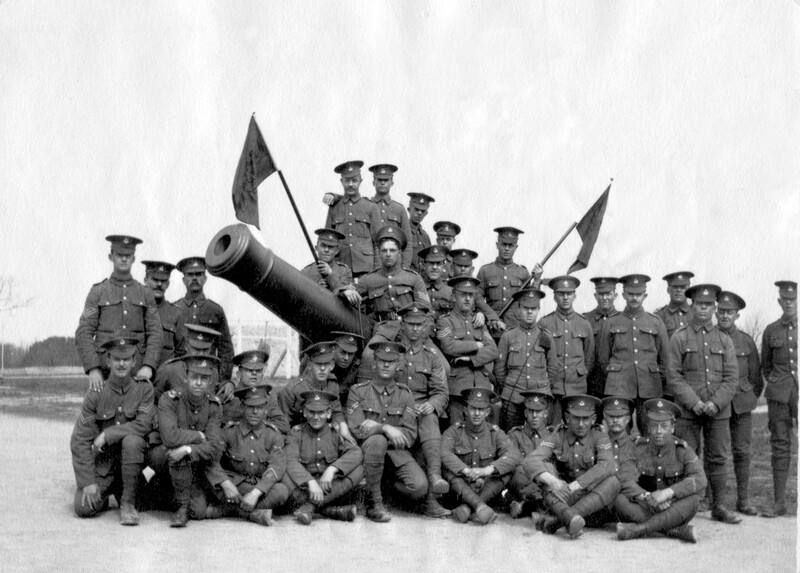 D Company in the 6th Royal Irish Regiment is joined by a further 39 men and 1 officer. The 6th Royal Irish Regiment has its first Guernsey Casualty. Private Pasquire is killed in an accidental shooting during training. 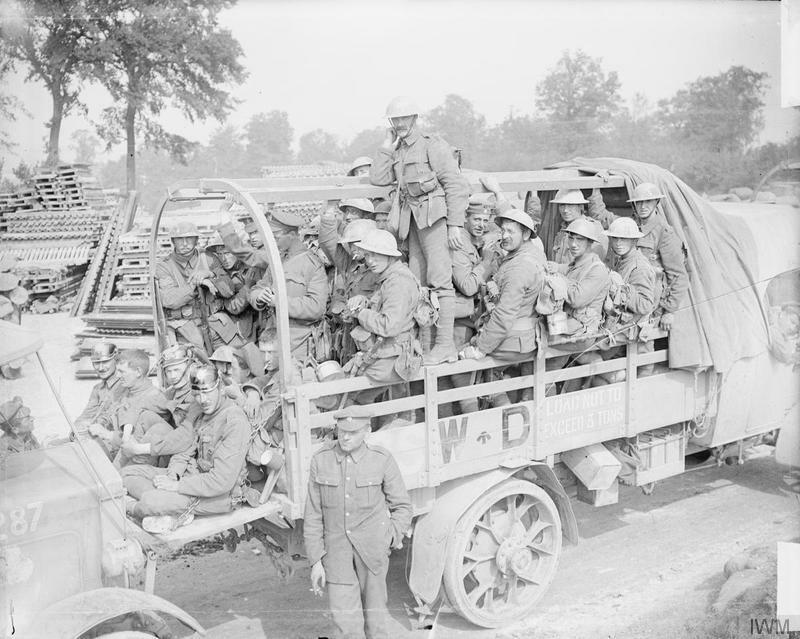 33 officers and 996 men of the 6th Royal Irish Regiment, including the Guernsey contingent, travel via Southampton and Le Havre to join the 47th Brigade, 16th (Irish) Division of British Expeditionary Force in France. The 6th Royal Irish Regiment land in France and go into billets at Drouvin. From here parties of officers and men are attached to the 8th London Regiment (Post Office Rifles) and go into the trenches for two days at a time for instruction. The battalion is withdrawn from the Front for a course of bombing training. Although parties of men have previously been into the line in December with the 8th London for instruction, this is the first time the 6th RIR go in for a full tour of duty. This time they are attached to 44 Brigade again for more instruction. A Company goes into the trenches with the 9th Black Watch, B Company with the 10th Gordon Highlanders, C with the 7th Cameron Highlanders and D (the Guernsey contingent) with the 8th Seaforth Highlanders. 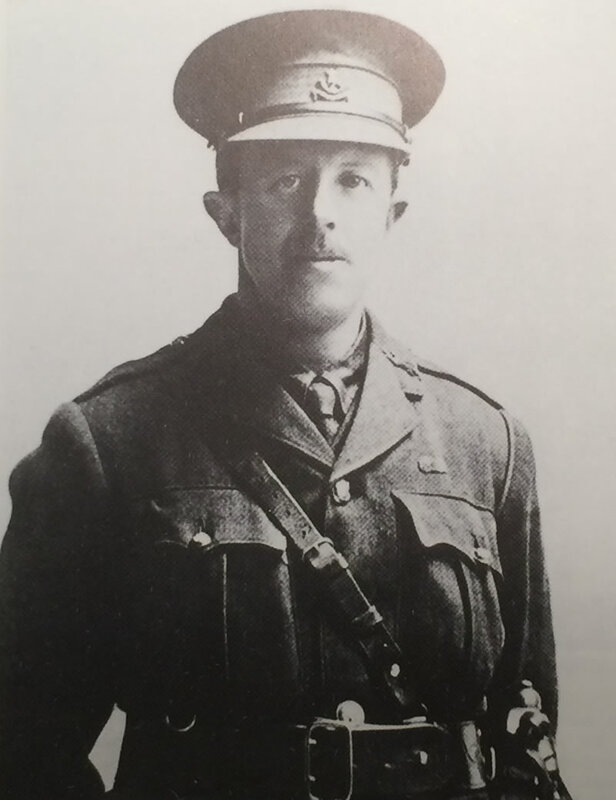 The first Guernsey casualties from enemy action occur when 40 year old Major George Le Page is killed. A number of other men are also wounded. 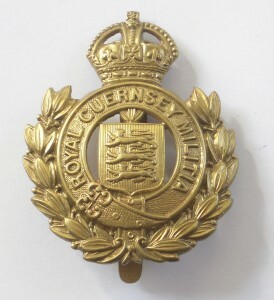 The Royal Irish Regiment Guernsey contingent alternates between short periods in the front line and support line, training in rest camps and being attached to work parties mending roads and carrying stores. 5 men of D Company are killed in a training session by a grenade. Royal Guernsey Militia marching along Smith Street to the White Rock and sailing away on board the “Ibex” to join the Royal Irish Regiment in March 1916. 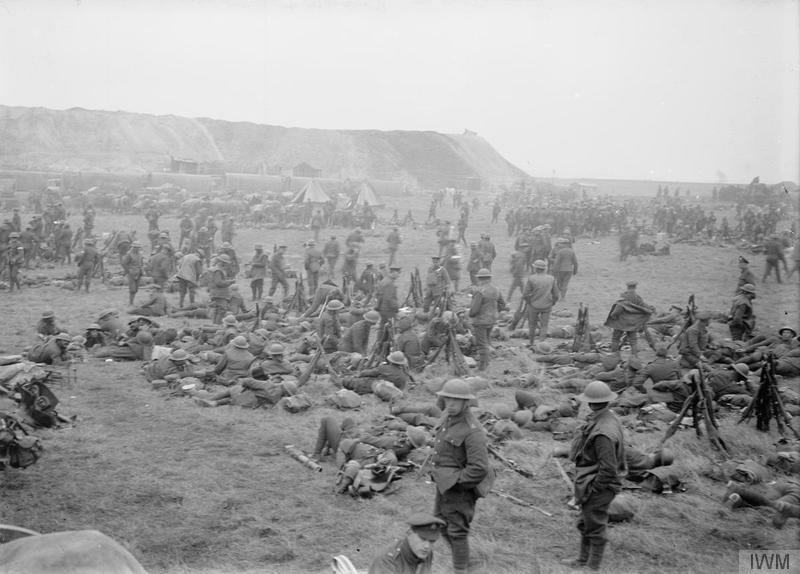 The Royal Irish Regiment moves up to Hulluch, near Loos and goes into the line on the 9th April relieving the 6th Connaught Rangers. April 03 – 3201 Private James Dumaresq is killed in action. April 06 – 3272 Private Wilfred Charles Le Ruez dies of wounds. April 09 – 3320 Private James William Quin is killed in action. April 10 – 3175 Private Hilary John Carré from the Castel dies of wounds. April 22 – 3197 Private Harold Domaille dies of wounds in hospital at Le Tréport. The Germans launch a fierce attack with chlorine & tear gas against the Irish Division. The 7th RIF were in the front line with the 6th RIR in the reserve trenches. The Fusiliers suffered heavy casualties before the Royal Irish could relieve them the next day. May 11 – 3255 Private Abraham Le Cheminant is killed in action. May 29 – 3361 Private Clifford Watts died of wounds. May 29 – 3207 Private George H Falla is killed in action. June 04 – 3218 Private William Gartell killed in action. June 06 – 3219 Private Alfred Gavey killed in action. June 07 – 3213 Private Eugene ( aka Edward) Flatres killed in action. June 08 – 3204 Private Thomas Ferbrache killed in action. June 10 – 483369 Private Albert Gillman killed in action. June 10 – 3226 Private James Guille died of wounds. The Division is not directly involved in the opening phase of the 1916 Battle of the Somme. During this time (July and August) the Division remains in the north near Loos continuing with their alternate periods in and out of the line. July 12 – 514049 Private Louis Orvin is killed in action. July 12 – 3350 Private William Thoumine is killed in action. July 17 – 498345 Private Arthur Le Page dies of wounds in hospital. Aug 17 – 3488 Private Thomas Russell killed in action. Aug 19 – 3144 Sergeant Yves Le Cocq died of wounds and is buried at St Matthew’s Churchyard, Cobo, in Guernsey. The 6th Royal Irish Regiment leave the Loos area and move by road and rail to the Somme to join the offensive. The 6th Royal Irish Regiment are relieved by the 12th Kings Royal Rifles and spend the next couple of days in bivouac at Carnoy. The Royal Irish Fusiliers attack Combles Trench. Attacking through waist high corn they stumbled into hidden belts of barbed wire. They eventually achieve their objective but at a terrible cost with 236 killed and wounded. Amongst them 3 Guernseymen are killed. The 6th Royal Irish regiment return to the front line to relieve the 8th Inniskilling Fusiliers. The 6th Royal Irish Regiment attack the village of Ginchy but fail to take it. The enemy was said to be “well prepared” with five machine guns lining the parapet of their objective. 7 Guernseymen from D Company are killed. The Royal Irish Fusiliers then attack and finally take the village that evening, however, 3 Guernseymen from their own D company are also killed in the action. 2175 Sergeant Charles Austin, killed in action. 3156 Corporal Charles Barnes, killed in action. 3162 Lance Corporal Henry Bisson MM., killed in action. 3169 Private (Drummer) James Brehaut, killed in action. 3466 Lance Corporal Philip Duquemin, killed in action. 5456 Private Peter Roland (Rowland, Ruelland), killed in action. 3367 Private Edward Wood , killed in action. 23556 Private George Butland, killed in action. 21832 Private Walter Gallienne, killed in action. 22054 Sergeant Eustace Nicholson, killed in action. 4080 Rifleman Harry Cauvain , killed in action. 4185 Lance Corporal George Pearce, killed in action. On the 10th September the 6th Royal Irish are relieved at dawn by the 4th Grenadier Guards. However the Royal Irish Fusiliers stay on and in holding the positions that were captured the Royal Irish Fusiliers continue to loose men. Sept 10 – 21891 Private Fred Queripel, killed in action. Sept 10 – 21901 Private Alfred Salmon killed in action. Sept 11 – 21808 Corporal John Cluett died of wounds. The 16th Division is relieved from the line and sent to the Kemmel-Poperinghe sector to rest and recouperate from their ordeal. Because of heavy losses on the Somme the 7th Battalion of the RIF is amalgamated with her sister 8th Battalion to form the 7/8 Batallion RIF. During this time the battalions also get on with the task of training and assimilation of new soldiers. The States suspends the Militia in Guernsey & introduces the Conscription Act. Unlike the English act introduced earlier that year, no provision was made for conscientious objectors. The R.G.L.I. has formally come into being. All the Guernsey Officers in 6th RIR & 7/8 RIF except 1 company will eventually be transferred to the 1st Service Batallion of the R.G.L.I. 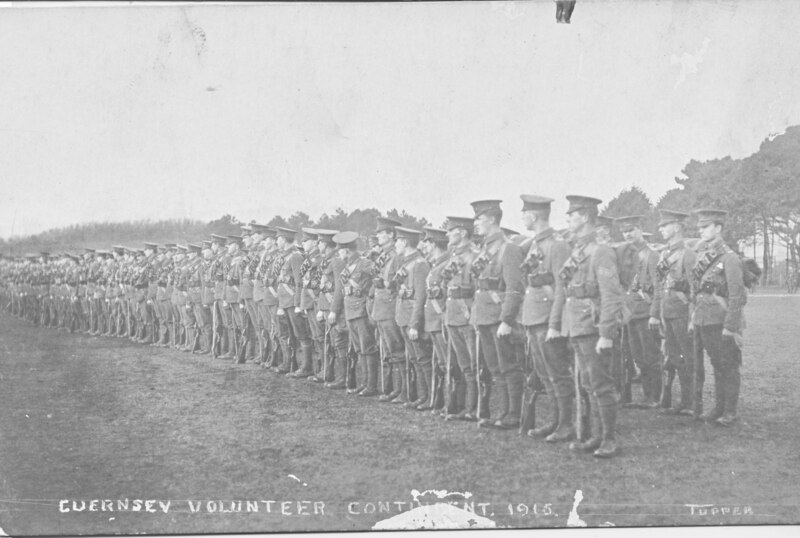 By April 1917 approximately one-third of the original volunteers will be on the strength of the RGLI and the two Guernsey Companies in the 6th Royal Irish Regiment and 7/8th Royal Irish Fusiliers are losing their purely Guernsey characters. As a prelude to what would later be known as “3rd Ypres” the 6th Royal Irish Regiment and the 7/8th Royal Irish Fusiliers attack Wytshaete ridge in Flanders. The attack is proceeded by the exploding of 19 mines under the German lines. The 7/8th Royal Irish Fusilers see 25 men killed, including 1 Guernseyman, and 145 wounded. The attack would later be regarded as one of most successful ever on the western front. On the 31st July 1917 ‘3rd Ypres’ officially starts. Unseasonable torrential rain and continual shelling have turned the battle field into a quagmire. Men literlly drown in the mud. Into this maelstrom the 6th Royal Irish Regiment and the 7/8th Royal Irish Fusiliers are thrown. The 7/8th Royal Irish Fusiliers lose 24 dead, 105 wounded and 90 Missing. 3 of the dead are Guernseymen. The 16th Irish Division attacked Tunnel trench at Croiselles as part of the Battle of Cambrai – the first ever en masse attack with tanks. It is a huge success and the 7/8th Royal Irish Fusiliers achieve their goal in minutes. However 1 Jerseyman Sergeant Peter Lorier, who’d enlisted with the Guernseymen in 1915, is killed. The RGLI is blooded as a Regiment on this day too and joins the offensive on Nine wood. The war of attrition takes it’s toll on the BEF and Brigades are reduced in size from 4 Regiments to 3. The 6th Batallion Royal Irish Regiment is therfore disbanded and it’s members incorporated into other units. The following day, February 10th, the 7/8th Royal Irish Fusilliers is also disbanded. Following the disbandment of the 6th Royal Irish Regiment and the 7/8th Royal Irish Fusiliers the remaing 42 Guernseymen in 6th are transferred to the 2nd Battalion and then to the 1st service Battalion of the RGLI. The remaining 23 men in 7/8th Royal Irish Fusiliers are also transferred to the RGLI on this day.